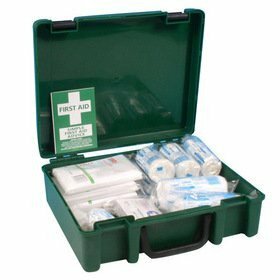 Our range of HSE Standard First Aid Kits enable you to comply affordably with the minimum requirements under current Health and Safety Regulations. For first aid refills, please contact our sales team. Our range of HSE Standard First Aid Kits enable you to comply affordably with the minimum requirements under current Health and Safety Regulations. For first aid refills, please contact our sales team. Clip in wall bracket for 10 persons first aid kit. Our range of HSE Standard First Aid Kits enable you to comply affordably with the minimum requirements under current Health and Safety Regulations.Each kit is supplied with our new Elite Series First Aid content combining excellent quality and value. This kit can be used in conjunction with a wall bracket. 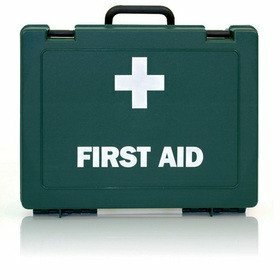 First Aid Kit size: 250 x 170 x 80mm. 2 No 16 eye pads. 6 medium sterile dressings 12cm X 12cm. 2 Large sterile dressings 18cm X 18cm.